Wow...the cookie business has been busy lately! I haven't posted pictures on facebook lately because....well...I'm just as annoyed as everyone else with the new facebook changes. I tried to upload pictures for 2 hours one night and they just wouldn't load. I guess I'll try again soon and maybe facebook will be nicer to me. 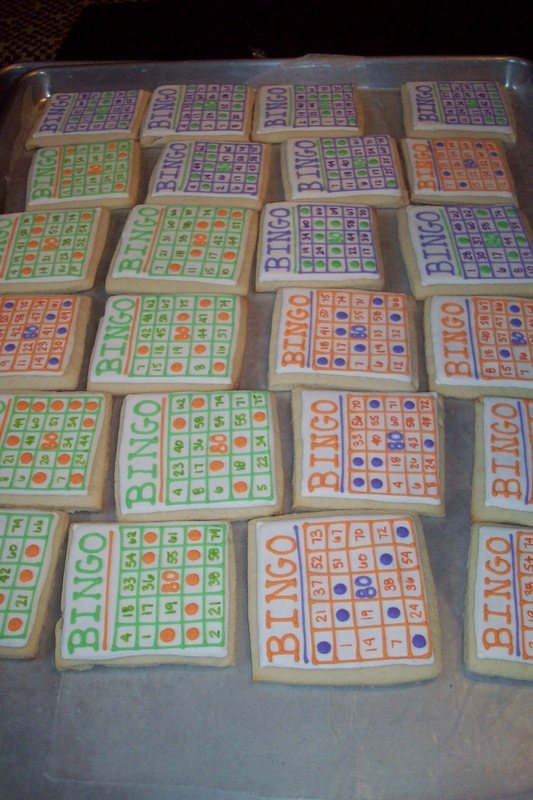 In the meantime...here's a riveting blog post about a classic game that I happen to love....BINGO! 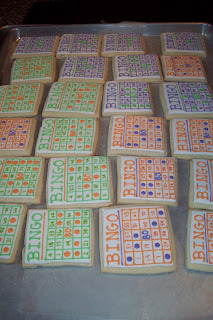 I got a call to do some Bingo card cookies for a client's mother-in-law's 80th birthday party. I was so excited because making cookies that are outside the box is really fun for me. I only wish that I'd had enough notice to do a couple of trial runs to get a better final product....but regardless I'm pretty happy with how they turned out. Just so you know for future reference...I am so so so so picky about cookie details that I usually end up hating the way that designs turn out. If I had the time I would probably re-make every order at least 5 times! Getting back to BINGO, I have some really great memories of playing Bingo with my Grandma Stell, who passed away years ago. She was the coolest grandma who worked at a bar and taught me how to play cherry machines, played the lottery daily and promised to take me to Children's Palace to pick out any toy that I wanted when she won, and would agree to a weekend trip to Atlantic City with just a moments notice. You could say that she was a gambler :) And we all loved her for it. Stell and my mom loved to go to play Bingo at the local firehalls and churches...it was sort of their mother-daughter time together. Can you imagine...time with your mom where you were never interrupted by cell-phone calls or emails or text messages? Those were the days.... I was so thrilled to tag along when I was 12 or 13...the thought of winnning $ at that age was like a dream. Stell had the embroidered Bingo bag full of Werthers Original candy, cans of Coca-Cola that she would sneak in(oh wait, that was the movie theater where she used to sneak in soda. I think it's totally legal at Bingo), a good-luck slot machine keychain, and of course the many many colors of Bingo dobbers (is dobber a real word?). 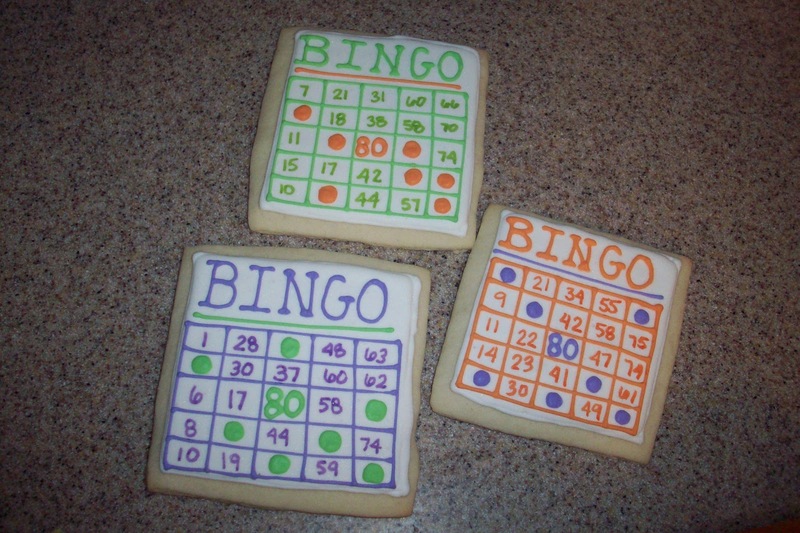 My grandma and my mom taught me all about the different Bingo pattern games...postage stamp, X, small frame, DOUBLE postage stamp, etc. lol. And let's not forget the elusive COVER-ALL game at the end where you're heart is pounding when you're waiting on one number for 4 calls...and then the lady at the end of the table with 76 bingo cards in front of her wins. Damn. Sooooo close! I haven't been to Bingo in awhile....but I bet if I call my mom right now...she'd know exactly what firehall is having the early-birds and big jackpots tonight :) She would pack up her slightly more fashionable Bingo bag that just doesn't get used enough these days and she would meet me in a heartbeat. She is so much like her mother...and I love her for it. These cookies are dedicated to Stell...who never saw her 80th birthday...I love and miss ya! By the way...I-19 was always my lucky Bingo number....what is yours?